Decadent White Chocolate Cranberry Scones with cherry yogurt baked right in. They’re moist and flaky with white chocolate and dried cranberry to add a delicious sweet texture. These scones are a great for Mother’s Day brunch recipe. Plus you’ll learn a way to make scones with less fat, while still being moist and flaky. These White Chocolate Cranberry Scones are not trying to hide anything. They are good old-fashioned baked sweets, and remind me of cooking from an era where home-baked goods were a regular thing. A dense and chewy dough is the base of these delicious scones. Add some white chocolate chips and dried cranberries for a unique and beloved flavor pairing. Cherry yogurt adds a subtle hint of cherry flavor. Finish with a sprinkling of large sugar granules for a subtle crunch to the soft scones. Scone vs. biscuit – What’s the difference? You should always use cold butter when making scones. It’s a really important step for the perfect scone texture, otherwise they will melt and deform in the oven and likely dry out too. It’s a good idea to cut the butter into the flour using a pastry cutter. This way you can avoid the heat from your hands melting the butter. To do this, cut the butter (almost like chopping the butter and flour together) until the butter is in very fine pieces and incorporated into the flour. Pro tip: If the room temperature is warm (during summer) you can freeze the butter for 5-10 minutes to make sure it’s extra cold before cutting. Your dough at first will seem very crumbly and loose, but will come together easily. The thing to remember is to not over-knead the dough or it will toughen the scones. Bring the dough together by folding and pressing until smooth (it shouldn’t need much work). 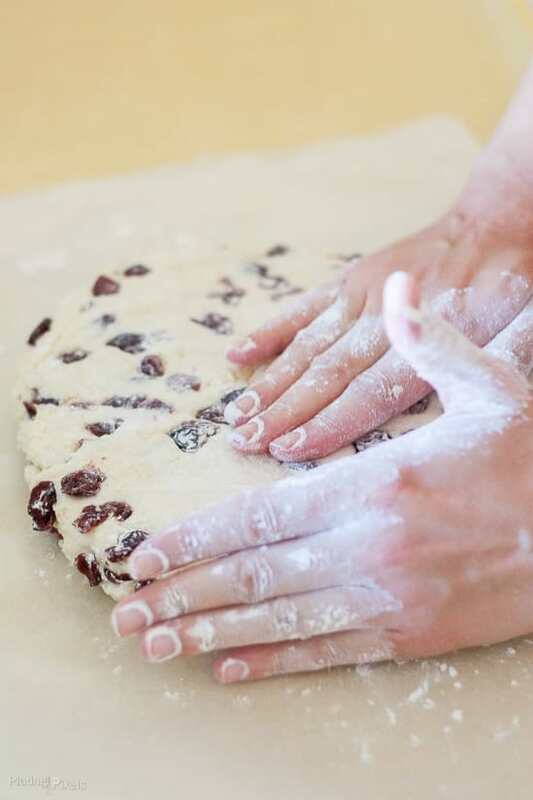 You can add a little more flour as you go to help with the kneading process and prevent stricken. Then simply pat into a round circle and cut into triangles. A healthier ingredient for moist scone is yogurt. Recipes can include this in addition to butter. 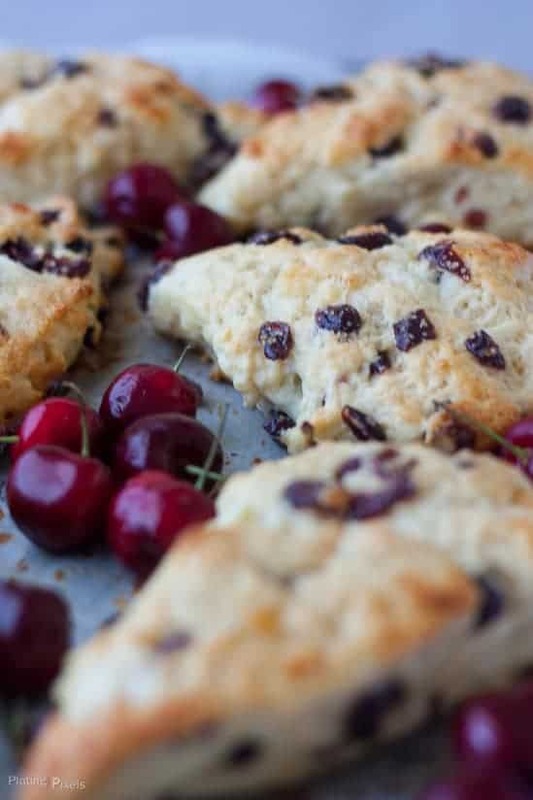 Cherry yogurt helps with the chemistry and flavor for these baked scones. Similar to butter, it keeps baked goods moist. I opted to use some butter in this recipe to keep them extra moist and flaky. However, I was still able to reduce it by over half a stick with this substitution. In a large bowl stir together flour, sugar, baking power, and baking soda. Add butter pieces and cut in with a pastry cutter until evenly incorporated. Stir in dried cranberries and white chocolate chips. Make well in center. In a separate small bowl combine eggs and yogurt, then pour into flour mixture. Stir together until just combined. Pat dough into flat, round circle and cut into 8 even triangular wedges. Placed on parchment lined baking sheet. Lightly brush tops with milk and sprinkle with extra sugar for garnish. Bake at 400 F for 12-15 minutes, or until golden brown. 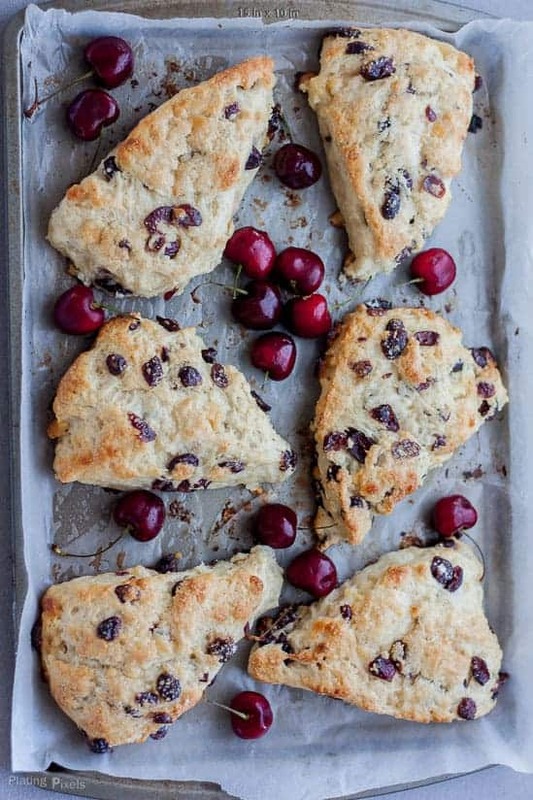 White Chocolate Cranberry Scones recipe baked with cherry yogurt. Moist, flaky scones. 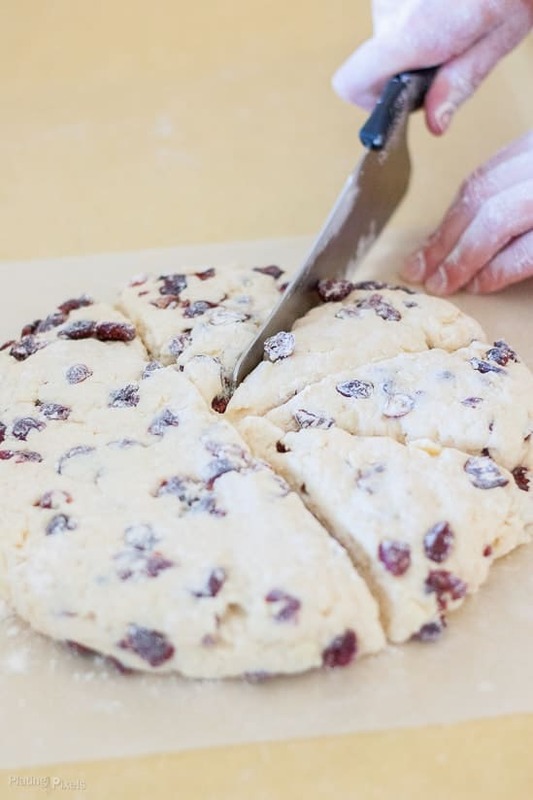 White chocolate and cranberry add sweet texture to perfect scones. Preheat oven to 400º F. In a large bowl stir together flour, sugar, baking power and baking soda. Add butter pieces and cut in with a pastry cutter, or break up and mix in with fingers, until evenly incorporated. Stir in dried cranberries and white chocolate chips. Make a well in center. In separate small bowl combine eggs and yogurt, then pour into flour mixture. Stir together just until combined. This part will be messy, but fun! Place dough on a smooth floured surface. Sprinkle with flour and knead by folding and pressing until smooth and combined, about 8-10 times. You'll probably need to sprinkle on more flour as you go until it thickens. Pat dough into flat, round circle about 1-inch thick and 9-inch diameter. Cut into 8 even triangular wedges. Place scones on parchment lined baking sheet. Lightly brush tops with milk and sprinkle with extra sugar for garnish and a bit of crunch. Bake at 400º for 12-15 minutes until golden brown. Cool slightly on wire rack and serve warm. These white chocolate cranberry scones would make a perfect Mother’s Day brunch recipe. If you want more inspiration, check out my 20 Mother’s Day Brunch Recipes Roundup. These are just in time for Easter Brunch! Scones are a favorite around my home but I’m excited to try them with a cherry flavor! Yum! They would make a great Easter or Mother’s Day brunch recipe. Hope you like them! Ooh! 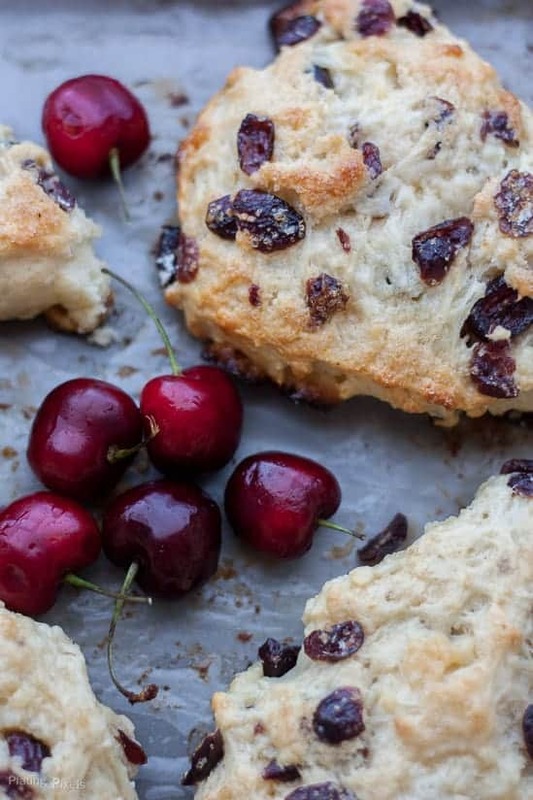 I absolutely love scones and the idea of using a cherry yogurt in a scone recipe. How tasty! Thanks Lucy! It creates a nice texture and does a bit of extra flavor. Pinned this, so ready for cherry season!! I love all your tips and information on scones! Thanks Pam. Glad all the recipe tips were helpful! Love this recipe! My whole family loves white chocolate, so I definitely have to make another batch ASAP! I’m so happy to hear the recipe was a hit, thanks! Thanks Adrianne and they do smell absolutely amazing Hopefully you have access to dried cranberries or Craisins. Scones have always scared me! But I am going to have to try these for sure! They can be a bit intimidating Britni, but they can actually be fun and easy to make too! Scones are a hit or miss with me. These looks like a great hit. Thanks April! I’m pretty sure they will be a hit with you! These look amazing! Beyond amazing! I keep saying I am going to try making scones…I need to just do it. This would be the perfect recipe to start with! Pinning! Thanks so much Michelle! You totally should and I’ve tested this multiple times so they’ll turn out great. Your scones look so delicious! I’ll have to pin them and make them later–thanks! Thanks for the compliment and pin Cathy! I hope you do. These sound amazing and your photos are so gorgeous! How clever! I love a good recipe for scones. I am intimidated by them, but, I think you make it look easy to make. Thanks Rini! I wrote the recipe as detailed as I could, so hope it’s a breeze for you. These sound way good! Thanks for sharing! Thanks and you’re welcome Britney! Love the combo of white chocolate and cranberries. YUM! I agree Serena, such a fun combo! Oh this looks yummy! Fun to make too. My kids would love to help me make this! That looks Devine! I love scones and we always make them for special occasions. I will have to add this one to my list for the next big family party. They will love it! Thanks Meagan! I’ve been getting into them more lately. Hope they’re a hit at the party! Oooh these look so good! I need to try out some scones for myself! Thanks Emily! And I agree you should. These look insanely delicious and thanks for the photography tips! Thanks Sandra! Glad you like the recipe and the food photography tips! Hi Amanda! I was happy to share it on your link party. Thanks for the invite!